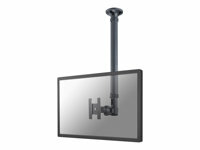 Ceiling mount for LCD display, black, screen size: 10"-30"
This NewStar LCD/TFT ceiling mount, model FPMA-C100, allows you to mount a LCD screen up to 26" to a ceiling. This model allows users to swing, lift, tilt (90 degrees) and turn the LCD screen for maximum efficiency and comfort. The height adjustment is 79 to 129 cm. The ceiling mount can easily be attached to the back of the screen using the universal VESA hole pattern 75x75, 100x100 or 200x100.